These are the perfect afternoon tea treat. 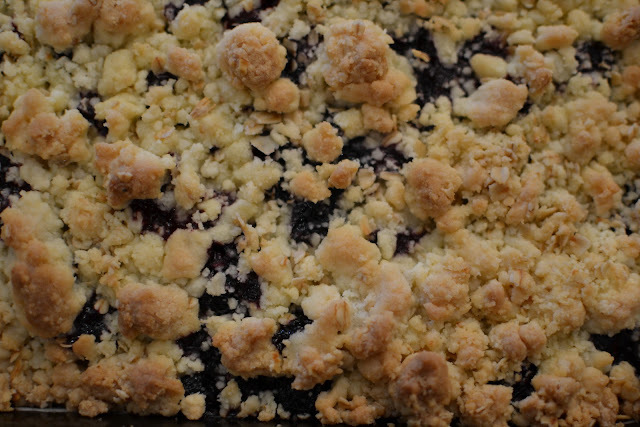 The shortbread is sweet enough to combat the tartness of the blueberries. 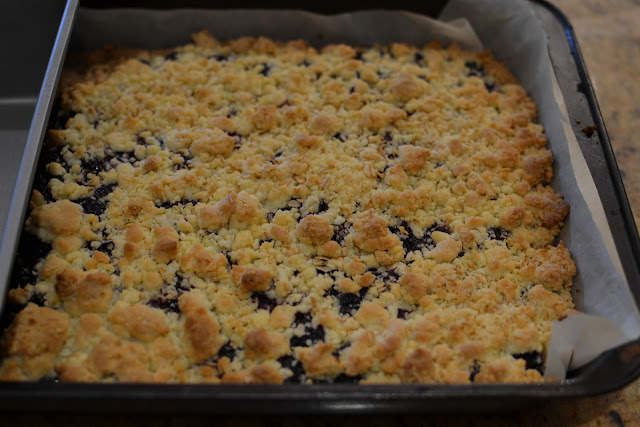 There is a subtle hint of lemon and the crumble adds an additional texture. They’re not very sweet so I suggest adding extra sugar into the blueberries mix if you happen to have very sour or tart berries. These slices also work well in lunchboxes or as dessert with vanilla ice cream. Perfect when you have a glut of blueberries. First, sort out the blueberry filling: mix the cornflour, sugar, zest and lemon juice in a bowl. Toss the blueberries in and coat them in the mix thoroughly. Set aside. Preheat the oven to 180C and line a rectangular tray with baking paper. For the shortbread, cream the butter and sugar until white and fluffy. Add in the flour and cornflour and mix until the dough just comes together. Press approximately ¾ of the dough into the bottom of the pan. You may need slightly less, you want the base to be about 1cm thick. Put the pan into the fridge and allow it to rest for half an hour. While the dough is resting, combine the last quarter with the oats. Scatter the blueberries over the base and then cover with the crumble mix. Don’t be over generous – you want an even mix of fruit and crumble. If there is too much just keep the excess in a sealed container in the fridge to use next time. Bake until the crumble is golden brown, about 20 minutes. Allow to cool in the pan before slicing and serving. This is a very versatile recipe. You can substitute the blueberries for other summer fruits like peaches, plums, and raspberries. You can also add in some nuts (pecans or almonds) to the crumble mixture for further texture.